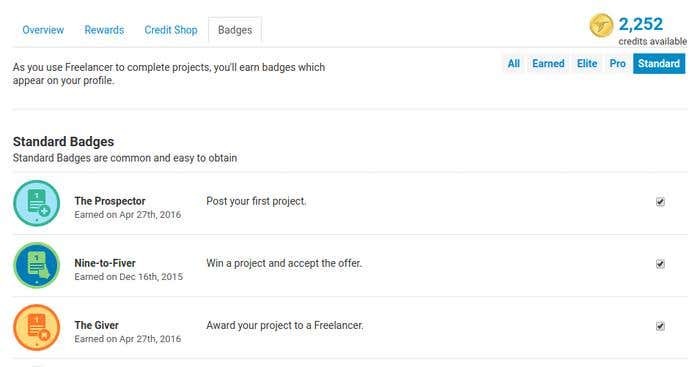 Did you know that you can earn rewards on Freelancer.com? Get additional benefits by using the website the way you normally would with the Freelancer Rewards program. One important benefit is that it helps boost your chances of winning projects. Read on to find out how. As you complete tasks and accomplish goals, like finishing a project, you earn experience points (XP) that increase your Rewards Level. As you advance through different levels, you unlock rewards and earn credits and badges that can help boost your earnings. 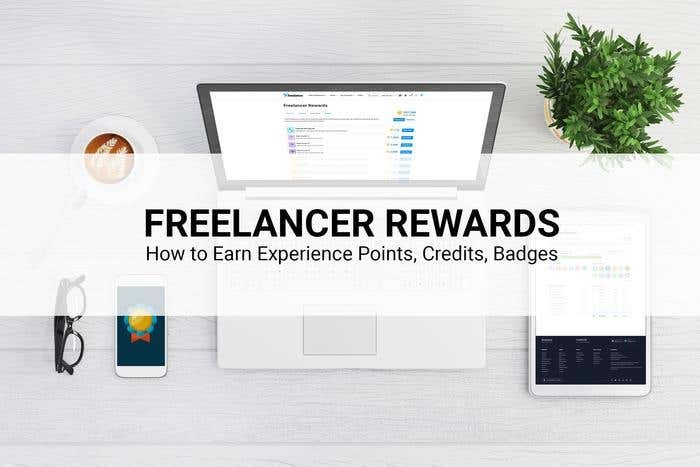 All Freelancer users are eligible to earn these rewards. However, only those with a paid membership plan can enjoy the benefits of the active rewards per Rewards Level and purchase items with their accumulated credits in the Credit Shop. Don’t you think it’s the best time to upgrade your membership plan? Now let’s talk about badges and credits. There are three badge categories — Standard, Pro, and Elite — in order of increasing difficulty. Standard badges are the most common and easiest to obtain. Pro badges are a bit rarer but can be obtained with a little effort. 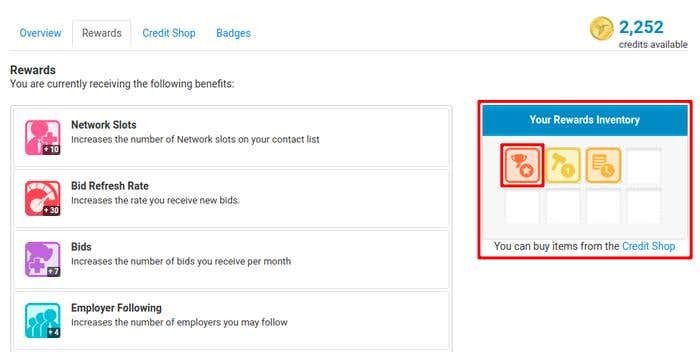 Elite badges are very difficult to earn and accessible only to our most dedicated users. 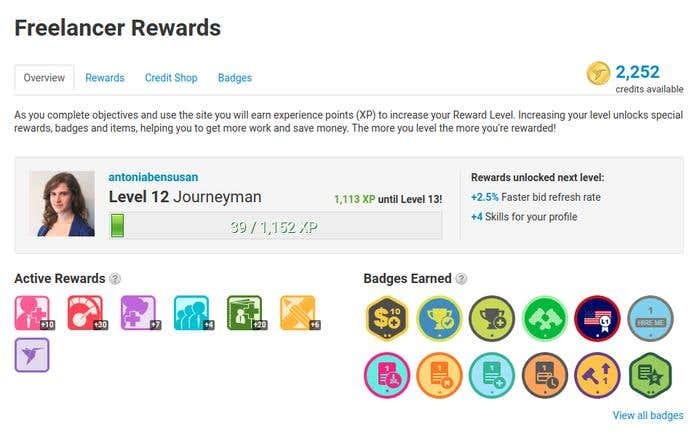 Find out how to earn these badges by visiting the Badges tab of your My Rewards page (you have to log into your Freelancer account to view the pages). Freelancer Credits are virtual currencies you earn for completing objectives and actions on the site. 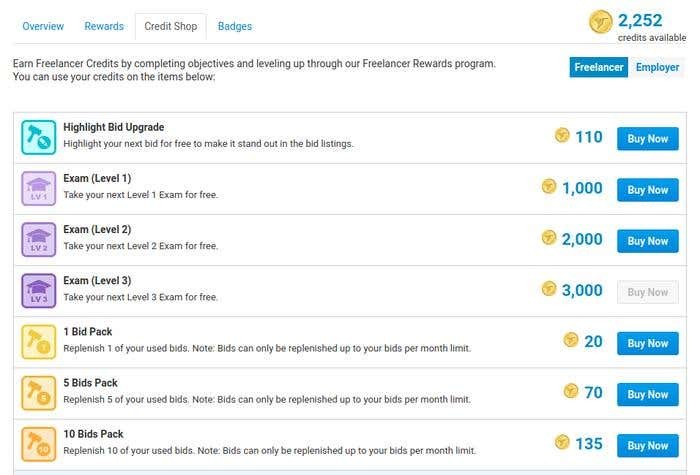 You also earn bonus Freelancer Credits when you increase your Rewards Level. You can spend these credits in the Credit Shop on various items such as free project/contest upgrades, exams, and extra bids. How can you get them? By going to your Freelancer Rewards page and checking how many credits you have available, you will see the items you can “purchase” with your current balance. You can get a free bid with as little as 20 credits. Once purchased, go to the Rewards tab, and click your purchased reward under "Your Rewards Inventory" to activate and use the item. Start using your rewards to win more projects and potentially increase your earnings! Continue bidding on and doing amazing projects to earn more rewards to maximize the perks of your Freelancer account. Anything tech and marketing related amazes me, and the urge to learn more about it becomes my new obsession! I am an extremely curious person, and there is nothing more fun than a good challenge! I love using the internet to learn new things, and share my knowledge with others! What Projects Do You Get Done on Freelancer?